Welcome to Joe Garriti Gems! Our products include individual gems, precious and semi-precious stones, gold, platinum, and silver jewelery, cameos, pearls, and watches. We also have uniques statues and carvings, Oriental, Indian, European and Domestic Items. Joe Garriti Gems is a part of James Garriti Lapidary, Inc. We have been in business since 1943. I've been on the Bowery in the Jewelry District since I was a kid. I, Joe Garriti am a second generation owner and had a great teacher in my dad. My dad and mom worked side by side as lapidary's (cutter and polisher of precious and semi-precious stones).Over the years our firm has collected a large inventory of many different gemstones from all over the world. We have expanded our lapidary and stone house business to the next level of manufacturing and designing of specialized jewelry for stores and private individuals also. I've taken GIA courses in colored stones identification, diamonds grading and jewelry counter sketching. I've taken bench jewelry work and wax carving courses at the Fashion Institute of Technology and NYU. I've been a collector my whole life of all types of items, from custom house auctions, regular auctions and flea markets. 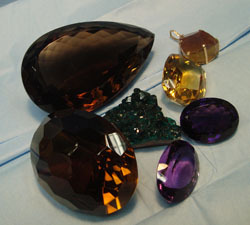 We replace and repair gemstones and jewelry. We also remodel and design jewelry, with your stones or ours .